Another flood has hit Round Lake School District after the devastating rainfall earlier this month. This time, however, it’s a flood of donations – specifically, books. Two Round Lake schools, W.J. Murphy Elementary and Raymond Ellis Elementary, suffered significant damage from the record rainfall July 11 and 12, and officials are working to ensure both schools will be able to open when the new school year begins next month. 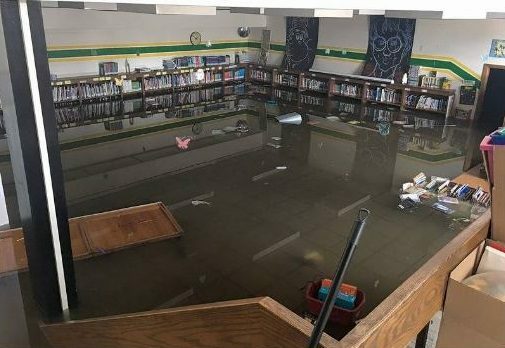 Murphy Elementary lost its library to the flooding, and word spread as photos quickly surfaced on social media showing water levels nearly 4 feet high in some cases. The community rallied to replace the destroyed books. Lori Placek, executive assistant to Round Lake’s superintendent, said the outpouring of donations was immediate and overwhelming. Placek emphasized that any book or monetary donations received would be distributed not just to Murphy Elementary but to all schools within the district. Any books not suitable for the school library will be donated to Round Lake Library and other organizations such as Bernie’s Book Bank, a Lake Bluff-based organization promoting child literacy for at-risk, low-income children. Dr. Phil Georgia, principal of Murphy Elementary, said there was no real number to represent the people or organizations that have donated books thus far. He said the district had been contacted by more than 100 individuals eager to provide assistance, although many anonymous donations have cropped up, as well. The silver lining, Georgia said, is Murphy will be receiving a new library. The facility last was remodeled 10 to 15 years ago. A completion date for the necessary repairs and renovations has not been set. Georgia said the school will be operating without a library “quite a few weeks” once the school year begins. “That’s where these donated books are really gonna be of assistance,” he said. “We’ll be able to put books in kids’ hands right at the beginning of school.